Update: this David vs. Goliath story with national implications was reported also on Fast Company , Business Insider; and NY Magazine. 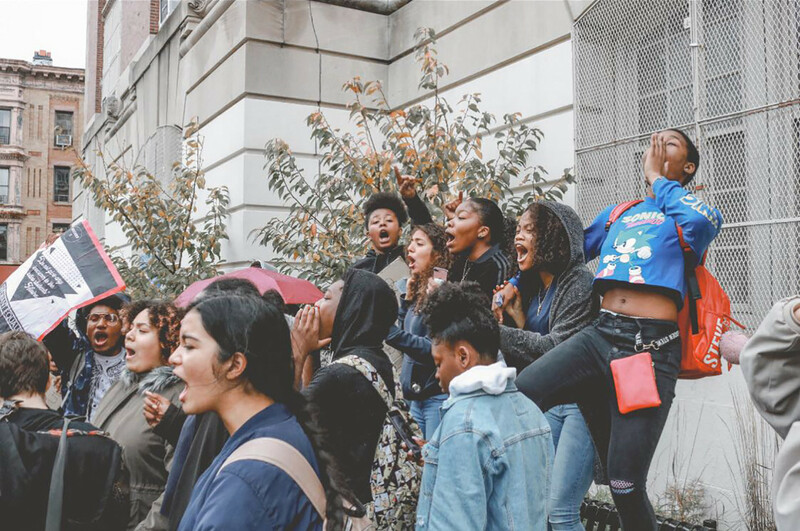 Last week, on November 5, about 100 students at the Secondary School of Journalism in Brooklyn walked out of their schools to protest the Summit online program. This digital instruction program, funded by Mark Zuckerberg of Facebook and Bill Gates, forces students to spend hours staring at computers, left at sea with little human interaction or help from their teachers, all in the name of "personalized learning." Since Norm Scott wrote about the walkout on his blog, and Sue Edelman's reporting in the NY Post, the story has been picked up elsewhere including Fast Company and Business Insider. The online program, which originated in the Summit chain of charter schools in California, and was further developed and expanded with millions of dollars from the Gates Foundation, Facebook and nowthe Chan Zuckerberg LLC, has now invaded up to 300 or so public schools, and is collecting a huge amount of personal data from thousands of students without their knowledge or consent or that of their parents. I have been writing and questioning Summit for the past two years, and last year, met with Diane Tavenner, asked her all sorts of questions she never responded to, and toured her flagship charter school in Redwood City. My description of this visit is here. Since then, parents in 15 states have reached out to me in huge distress about the negative impact of this program on their children. Many report that their children, who had previously done well in school, now say that they aren't learning, that they feel constantly stressed, are beginning to hate school and want to drop out. Some parents have told me that they are now homeschooling their kids or have decided to sell their homes and move out of the district. In response to the student protest last week in Brooklyn, the DOE now says they will eliminate the program for 11th and 12th graders - but not yet for 9th and 10th graders like Mitchel Storman. 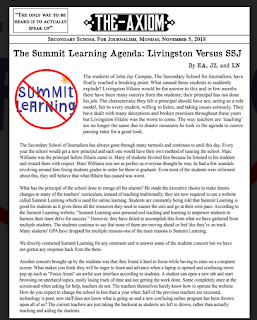 The NY Post article also revealed that the Bronx Writing Academy, which used Summit last year, has already dropped it. 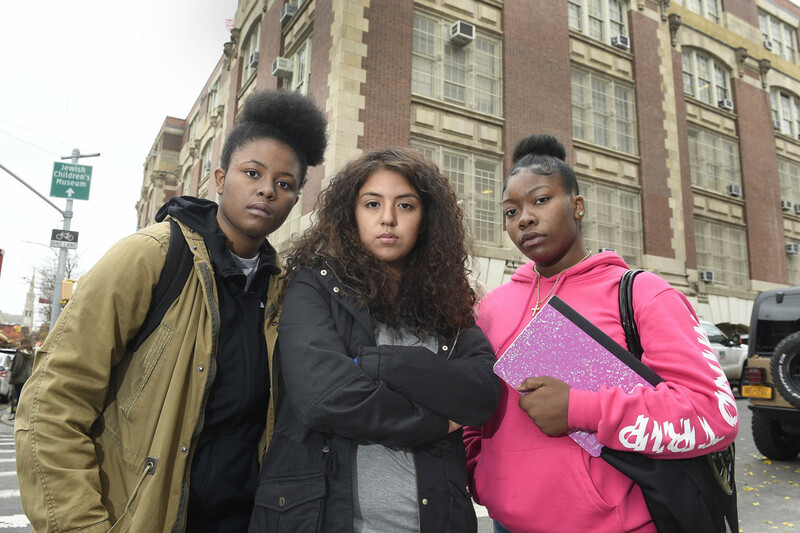 Yet two other NYC schools are still implementing Summit, including M.S. 88 Peter Rouget in Park Slope and the Academy for College Preparation and Career Exploration in Flatbush; with the latter school just adopting it this year. One wonders whether DOE officials are performing any oversight or evaluation of Summit before allowing more and more NYC schools to subject kids to this harmful program, and to examine whether it actually complies with the NY student privacy law. Recently Diane Tavenner revealed that next year, the online program would spin off to a separate nonprofit corporation, run by a board led by Priscilla Chan, Zuckerberg's wife and the CZI Chief Financial Officer. She also said the new corporation "doesn’t plan to expand the program, but rather, the new nonprofit will focus on meeting current demand." Yet a few days ago on Twitter , I saw that Summit is still entreating schools to apply . 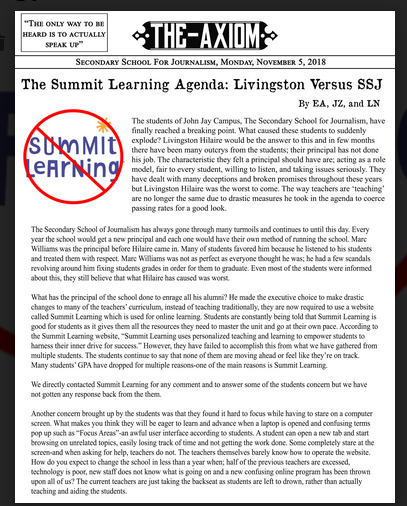 Below is a fact sheet I have shared with parents and students at the Secondary School of Journalism, and those at Summit schools nationwide, along with some suggestions of questions they can ask their schools and districts about the instructional program, its data collection and privacy protections (or lack thereof). Summit itself on its website states that parents and students have the right to demand the deletion of their personal data, and opt out of further collection of directory information, which includes their names, email addresses, and ID numbers, etc. and I suggest they do so immediately. More on this below. The fact sheet is also available as a pdf you can download here. Bravo to the courageous students at SSJ, who have taken the lead to fight for their own education, vs Zuckerberg, Bill Gates and the other ed tech oligarchs, who are attempting to control their classrooms and their personal data. As the recent NY Times series pointed out, Silicon Valley corporate leaders and engineers want one kind of education, largely screen-free, for their own kids, while imposing an experimental form of mechanized education on everyone else.